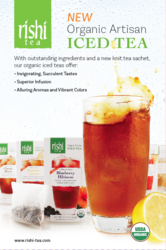 Rishi Tea, international purveyor of artisanal organic and Fair Trade CertifiedTM loose-leaf teas, announces new flavors, and reformulated blends to their Organic Artisan Iced Tea line. The Artisan line of home brewed iced teas has been curated to address surging demand for more engaging ingredients that are aligned with the growth of specialty gourmet and culinary trends in the United States. Rishi Tea has also utilized their novel sachet’s wider weave structure, which allows ingredients to infuse completely, offering a more aromatic, fuller flavor and infusion quality than any other fine mesh or paper filter could offer. “We’ve reformulated our artisanal teas and herbal blends to highlight a range of flavor points, all of which create an infusion that is even fuller and richer than before. We’re particularly enthusiastic about this renewed approach to our Artisan Iced Tea because we’ve put a lot of focus on sourcing high caliber ingredients over the years, and now we have a special knit, mesh sachet that allows our ingredients to be savored the way they were intended,” says Joshua Kaiser, Founder and President, Rishi Tea. The Organic Artisan Iced Teas from Rishi Tea enjoy the same degree of attention to quality, freshness and seasonality as any loose leaf tea in order to attain an improved vibrancy and flavor harmony. “We’ve been listening to our customers very carefully, while observing the trajectory of the tea market, and the Organic Artisan Iced Tea line’s reformulations, new varieties and updated packaging represents another significant investment we’ve made this year toward advancing the level of excellence in every conceivable aspect of the Rishi Tea brand,” says Beau Bernstein, Director of Marketing, Rishi Tea. A box of Artisan Iced tea has five sachets, each of which brews a rich, sumptuous quart of tea with a Suggested Retail Price of $6.99. Rishi's Artisan line of Organic Iced Teas are available now and include the following New flavors: Organic Pure Green Tea, Organic Jasmine Green Tea, Organic Sweet Peach (Caffeine Free) and Organic Turmeric Ginger (Caffeine-Free). Rishi Tea has reformulated its Organic Citron Green Tea, Organic Mango Black & Oolong Tea, and Organic Tropical Crimson (Caffeine Free). Returning favorites are Organic Blueberry Hibiscus (Caffeine Free), Organic Classic Black Tea and Organic Summer Lemon Black Tea. Rishi Tea was founded in 1997 and is America's leading organic loose-leaf tea brand. The company offers more than 100 types of organic loose teas, tea bags, iced teas, micro-brewed masala chai and unique accessories through its online shop, select coffee roasters, all natural and gourmet retailer channels. Rishi Tea is the most awarded tea company in the history of the North American Tea Championship and is a direct trade importer of the world's premium caliber of tea. The uniquely strong relationships with farmers in Asia, allows it to tailor make and curate each season's exclusive quality teas. Rishi Tea's extensive travel and study in the tea producing countries and its experienced staff serve as guides through the vast world of tea, its brewing customs and cultures.